As soft as silk and as durable as cotton, these bamboo derived sheets are at the meeting point of style, comfort and durability. Made from 100% Bamboo derived Rayon, this set of sheets allows your body to breathe in the summer while keeping you warm in the winter. Available in 8 multiple bold solid color selections, these sheets will be sure to bring life to any bedroom design. These high quality sheet sets will give you lasting comfort while you sleep. 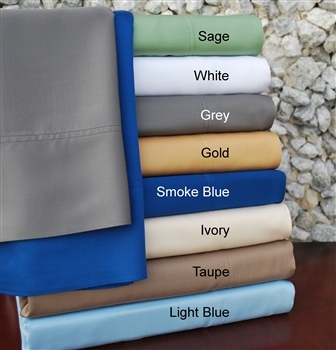 Our 300 Thread Count sheets are available in 8 Colors in Twin, Twin XL, Full, Queen, King and California King. Each set includes a flat sheet, fitted sheet with matching pillowcases (one with Twin). 3pc Twin Sheet Set Dimensions: (1) Fitted 40"x77", (1) Flat 68"x99", (1) Pillowcase 21"x32"? 3pc Twin XL Sheet Set Dimensions: ? (1) Fitted 40"x82", ? (1) Flat 68"x103", ? (1) Pillowcase 21"x32"
4pc California King Sheet Set Dimensions: (1) Fitted 74"x86", (1) Flat 111"x105", (2) Pillowcases 21"x42" each?